Artistic Director Thomas W. Morris will retire from the Ojai Festival after the 2019 festival, of which Barbara Hannigan will be the music director. He will have been Artistic Director for 16 years at that point. Press release after the cut. Hmm, well. Well I don’t want to give offense,” said Jansons, “and I am not against it, that would be very wrong. I understand the world has changed, and there is now no profession that can be confined to this or that gender. It’s a question of what one is used to. I grew up in a different world, and for me seeing a woman on the podium… well, let’s just say it’s not my cup of tea. In the United States, a gaffe is defined as "when a politician accidentally tells the truth." That first, unguarded remark very likely represents what is in Jansons' heart. I hope that he is taking the opportunity to go see MGT, Susana Mälkki, Marin Alsop, and their peers so that seeing women on the podium can become his cup of tea. The great baritone Dmiti Hvorostovsky died on November 21 at 55. He had announced in 2015 that he was being treated for brain cancer. He was able to make some opera and recital appearances after that, but the tumor affected his balance and that made opera much more difficult for him. He appeared at San Francisco Opera six times, and I saw all of them, from 1996's Barbiere (Figaro) to the most recent staging of Il Trovatore (di Luna). I'm sorry that the only Russian role I saw him in was in The Tsar's Bride. I'm sure he was a fabulous Prince Andrew in War and Peace and Onegin, in the eponymous opera. He had a most beautiful voice, perhaps a bit on the light side for Verdi, but he made those roles work for him anyway. RIP, and condolences to his family and loved ones. The eight singers selected as 2018 Adler Fellows are sopranos Sarah Cambidge (Vancouver, B.C., Canada) and Natalie Image (Tsawwassen, B.C., Canada); mezzo-soprano Ashley Dixon (Peachtree City, Georgia); Aryeh Nussbaum Cohen (Brooklyn, New York), who becomes the fourth countertenor to join the program after Brian Asawa, Gerald Thompson and Ryan Belongie; tenors Amitai Pati (Auckland, New Zealand) and Kyle van Schoonhoven (Lockport, New York); baritone Andrew G. Manea (Troy, Michigan); and bass-baritone Christian Pursell (Santa Cruz, California). Natalie Image, Ashley Dixon, Aryeh Nussbaum Cohen and Christian Pursell are incoming first-year Adler Fellows. Sarah Cambidge, Amitai Pati, Kyle van Schoonhoven and Andrew G. Manea return as second-year fellows. All artists begin their fellowships in January 2018, except for Aryeh Nussbaum Cohen who begins in July 2018. Director Aria Umezawa (Toronto, Canada) continues her fellowship for a second year. Umezawa will participate in all aspects of fellowship training, including dance classes, language classes and score studies. She will also work with the Adler Fellows on their audition repertory and participate in other San Francisco Opera Center activities. This December, she stages the Opera Center’s The Future Is Now concert showcasing the 2017 Adler Fellows performing with the San Francisco Opera Orchestra at the War Memorial Opera House. The pianists selected for Apprentice Coach Fellowships are first-year fellow César Cañón (Bogotá, Colombia) and returning second-year fellow John Elam (Cleburne, Texas). The Adler Fellow apprentice coaches work closely with Mark Morash, Director of Musical Studies of the Opera Center, and John Churchwell, Head of Music Staff at San Francisco Opera. The coaches participate in the musical activities of both San Francisco Opera and the Opera Center, and they are involved in all aspects of the Adler Fellows’ training by acting as pianists for master classes, working with master coaches and preparing the Adler Fellows for concerts and mainstage roles. The BSO released an update from Andris Nelsons on the matter of sexual harassment in the classical music world. It's unfortunately a jpg or something; I can't find the text on the BSO web site's press section, but I will transcribe it below. During a recent interview with Jim Braude and Margery Eagan on WGH's Boston Public Radio I did not express myself as clearly as I would have liked when asked about the issue of sexual harassment in the classical music world. In my own experience working in the classical music industry for many years, I myself have not seen overt examples of sexual misconduct in my day-to-day work life. That being said, this kind of offensive behavior, unfortunately, takes places in all fields, including, of course, the classical music industry. All of us in the field must remain constantly vigilant and fight against all types of inappropriate and hurtful behavior, and continue the essential work of creating a fair and safe work environment for all classical musicians. Though involvement in music and the arts can't cure all the ills of society, I do believe that the inspiration they provide has the potential to help us reflect at times on the better angels of our natures. Or more simply put by Beethoven -- the genius composer of the Ode to Joy symphony, considered the universal anthem of brotherly/sisterly love -- "Music can change the world." I have to say, this is pretty awful. Fake Beethoven quote; "I've never seen it myself", which is so often a way to cast doubt on those who have, and which is most easily said by powerful men whom nobody IS going to harass, and nobody will harass another in front of; unwarranted belief in the inherent goodness of a musical style; citation of a work that has a wide variety of associations; "I didn't express myself as clearly as I would have liked." No, you didn't; it's pretty clear that you believed what you originally said and had to be talked down. By now, the BSO legal department has probably got him in their office explaining that just by making that statement, he created an environment in the orchestra where anyone being sexually harassed might be afraid to come forward, since their music director has said that it's just not a problem in classical music. And perhaps Kristine Opalais has had a word or two with him as well. Girls of the Golden West: Go See It! 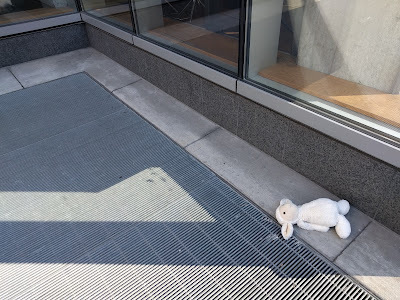 If you read this blog, you know that next week San Francisco Opera will present the premiere run of performances of Girls of the Golden West, by John Adams, libretto by Peter Sellars, directed by Peter Sellars. I have not seen it, I have heard only the short orchestra bit "Lola Montez Does the Spider Dance," I have seen the same public photos everyone else has, but I'm telling you, get a ticket and see this. It's not often that a great composer like Adams writes an opera, and lots of composers - I'm looking at you, Ludwig van - don't have the theatrical flair you need to write successful operas. 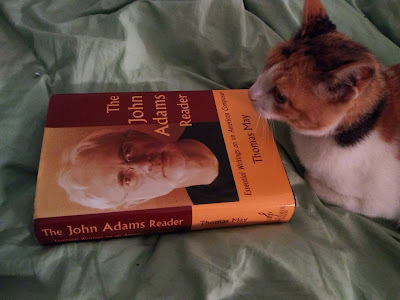 So Adams is sitting in a particular sweet spot in musical history, along with, say, Mozart, Berg, Britten, Shostakovich, and a few others I could name who excelled in orchestra music, chamber music, and operas. So get a ticket. I haven't read the libretto yet, haven't seen the staging, haven't heard a note of the music. There's likely to be some terrific music, even if, at the end of the night, you are scratching your head about one or another aspect of the opera. Here's Adams talking about the show on WNYC. I woke up from a dream in which I had somehow been appointed to conduct the world premiere of Girls of the Golden West. And it was two weeks until the date, and nobody had provided me with the score. I have basic conducting skills, it's true, but they are very basic and they have deteriorated since grad school, when I was an assistant conductor of one of the choruses at Stony Brook and led sectional rehearsals of the Missa Solemnis. I led a rehearsal of a very tiny chorus doing comparatively uncomplicated music earlier this year, with no personal rehearsal of the pieces we worked on, and I could wing it fairly well. But there is no way I could conduct a John Adams opera without lengthy study. NO WAY, you hear me? Realistically speaking, if Grant Gershon is not, for some reason, able to conduct, the most likely substitute is JCA himself. There can't be many people who know the score well enough to step in and conduct GGW. Reading Russell Platt? If Not, You Should Be. The New Yorker is lucky enough t have two first-class classical music writers on board. I'm sure you know Alex Ross's work, and his books, and I hope you're also reading writer, editor, and composer Russell Platt, whose short articles appear on line, but not in the printed New Yorker. If not, you can start here, and I'm sure you will like what you read. Justin Davidson, A Triple Dose of Expert Monteverdi. "The results were predictively, even oppressively, exquisite." 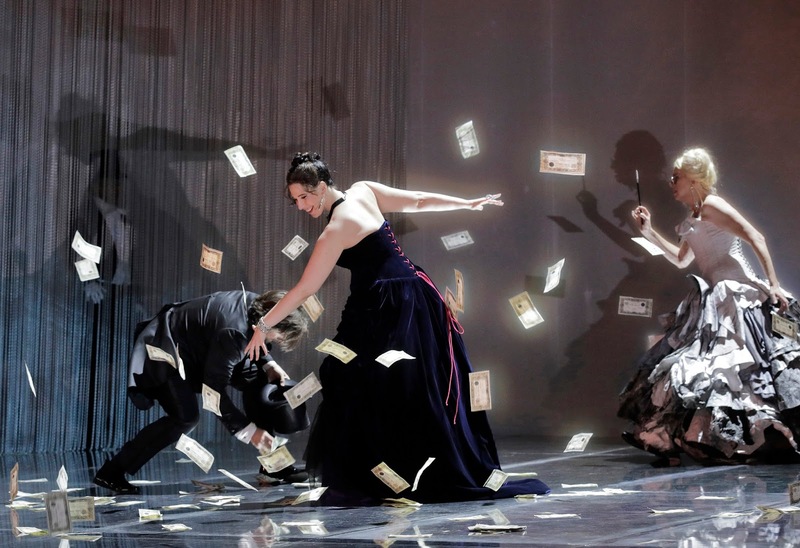 Long ago, A.C. Douglas was incredulous that I'd rank L'incoronazione di Poppea with Le Nozze di Figaro, but after seeing four productions, I'll stick with that assessment. It is among the very greatest of operas. Updated on Saturday, Nov. 11, to add Alex Ross's review and my closing comment, then bumped to the top of the blog again. That would be: War Memorial Opera House Acoustical Weirdness Syndrome. Everybody seems to suffer from it from time to time. Okay, so my reservations are largely nonmusical. But I made a mistake: I swapped my Dress Circle seat for Orchestra M, nearly dead center, which is the perfect location for hearing the orchestra, but voices tend to be more recessed there than when you're up above them. And, goddamn it, the voice most affected by this was Christine Goerke's, presumably because of its placement, dark color, and the tessitura of the title role, which lies more in the low and middle ranges. The other singers came over well, and I am kicking myself for relocating to the orchestra rather than Grand Tier....or staying in my subscription seat. So I feel that I can't make a fully-informed comment on her performance, and, well, this is a frustration. I've heard her live multiple times and I know perfectly well that she's got a very large and well-projected voice, and I also know about the vagaries of the acoustics of the War Memorial Opera House. No reviewer complained of problems hearing Goerke. It was, no doubt, my seat. 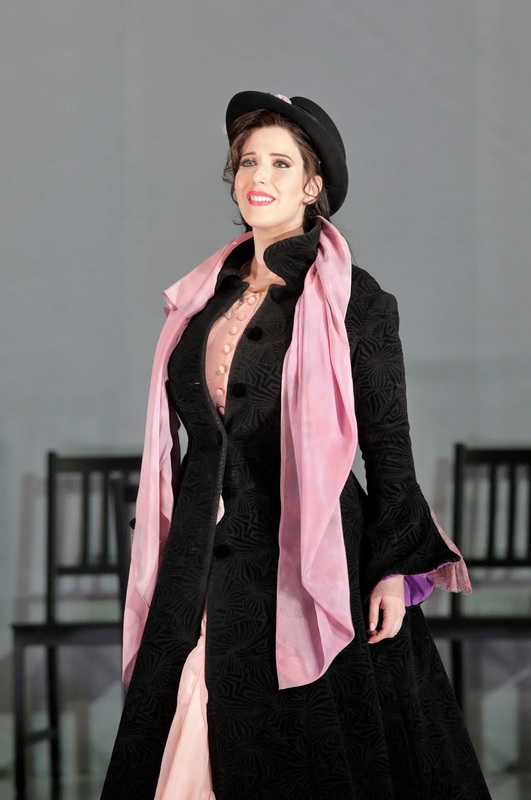 That sense was not always easy to come by in the face of an on-again, off-again role debut by soprano Ellie Dehn as Manon, a performance that alternated almost minute by minute between splendid, pointedly vulnerable vocalism and recessive vagueness. 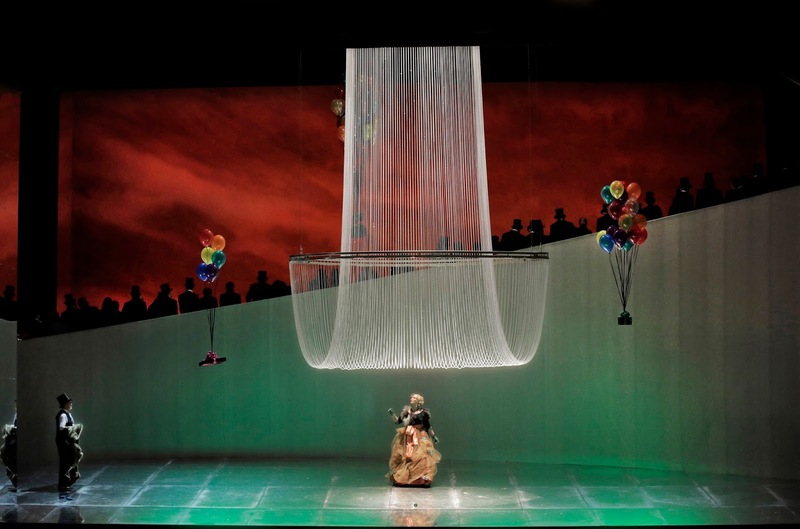 Also not helpful were the visually barren, dramatically off-point production of director Vincent Boussard and set designer Vincent Lemaire, and the brusquely athletic musical direction of conductor Patrick Fournillier. Dehn, meanwhile — a singer who has done excellent work here in not-quite-starring roles — flickered on and off unpredictably. Through much of Act 1 she sang so inaudibly that one might have thought she was “marking,” husbanding her vocal resources as singers do during rehearsals. For Manon, I was in my usual subscription seat, which is more or less dead center in the Dress Circle. I'm under the overhang, but just a bit. I heard every note Dehn sang. She was always perfectly audible, at every dynamic level. Then there was Les Troyens. Both Greg Freed and I had issues hearing Anna Caterina Antonacci in the first performance, but up to a point, she came over perfectly well - Steven Winn, sitting three rows ahead of me, found her quite audible. The fact is, the War Memorial Opera House has some dead spots, some live spots, some places with echoes. If you are too close to one of the walls in the orchestra section, yes, you hear the orchestra, especially, bouncing off the walls. I never comment on the balances in the works I review, because I know I'm not getting the best possible sound from the reviewer section. Generally, the sound and balances are best from the center and above the floor, though the Orchestra section can be fabulous; the orchestra itself almost always sounds splendid from orchestra center, around row M to R. But Joshua's review of Manon and mine of Elektra certainly show the vagaries of the house. Yuppie beverages as far as the eye can see at Woodland Market near my office. 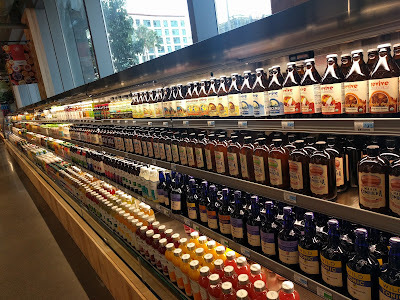 Kombucha in bottles to nitro cold brew in cans, via ginger-tumeric almond milk. Nicely bottled, all very expensive. Compare with 79 cents for a half-pint of old-fashioned chocolate milk. With those deep-set eyes of his, it just makes no sense; what he needs is a wig and make-up that brings out his eyes and gives his face and head more definition. There was a long period of time - probably around ten years - when I thought I didn't like Massenet. Then I heard Esclarmonde, his almost-Wagnerian magic opera, and also Werther, and thought that maybe the problem was that I didn't like Manon, the first Massenet opera I'd seen. More recently, I listened to Pierre Monteux's Manon recording, with a Francophone cast except for Victoria de los Angeles, and realized that what I didn't like was the deadly conducting of Julius Rudel in SF Opera's 1998 revival of the opera. I checked Joshua Kosman's review recently, and it confirms my recollection (even at the time, I knew it wasn't good). Saturday night, at the opening of SFO's new Manon, I mentioned Rudel to a couple of friends with long memories, and they both rolled their eyes and agreed with me. Too bad: Manon should have been a great part for Ruth Ann Swenson, and that night, it wasn't. But times have changed, and a few changes of general director down the road, we've got a new Manon. 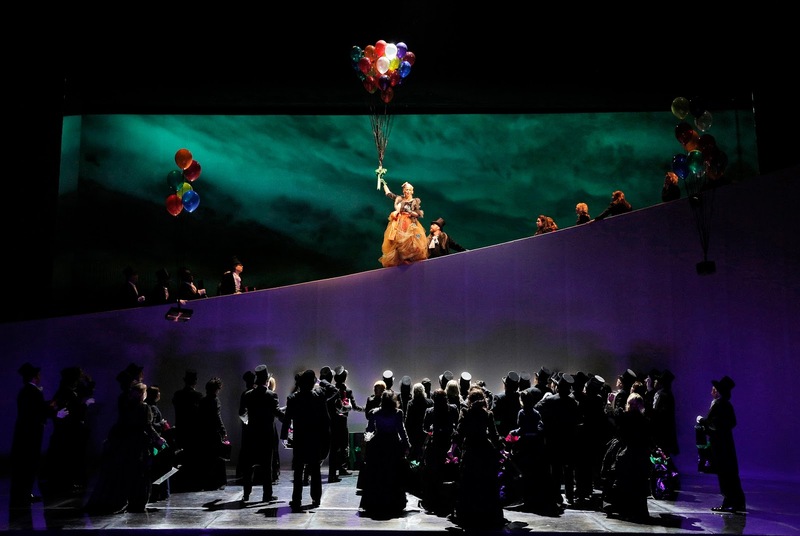 David Gockley commissioned this production, which is a co-production with the Lithuanian National Opera and the Israel Opera and directed by Vincent Boussard. It is an improvement over 1998 in nearly every way, swapping a period production for a slightly racy cross-period design and costumes. (Cross-period to the point of dressing Reneé Rapier in a purple pants suit, no shirt, and matching purple bra.) The production was designed by Vincent Lemaire and lit, very beautifully, by Gary Marder. More about all of this later. Both Ellie Dehn, as Manon, and Michael Fabiano, as the Chevalier Des Grieux, were making their debuts in those roles, and neither disappointed. Dehn sounded absolutely gorgeous, with beautiful tone, spin, projection, truly impressive dynamic control, and pretty good French. She was also dramatically convincing as the pleasuring-loving Manon, just out to have a good time until her last-act demise. I'm a Fabiano fan, but initially I was a bit concerned. 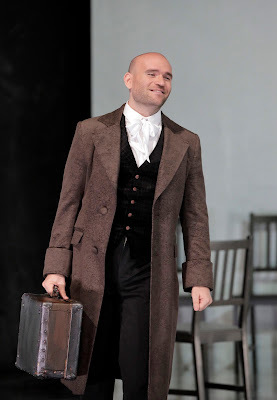 At his Act I entrance, his voice sounded darker and thicker than in his last local appearance, as Don Carlo in the June, 2016, production of the eponymous opera. It opened up during the first part of the opera, and by the end I wasn't worried at all, although I will note that for some soft high notes, he used what sounded like a slightly croony voix-mixte. His sound and his French are really too Italian for this particular opera; the vowels were open and coming from the back of his head when they should have been forward and pointed. The sound itself was beautiful, and big. 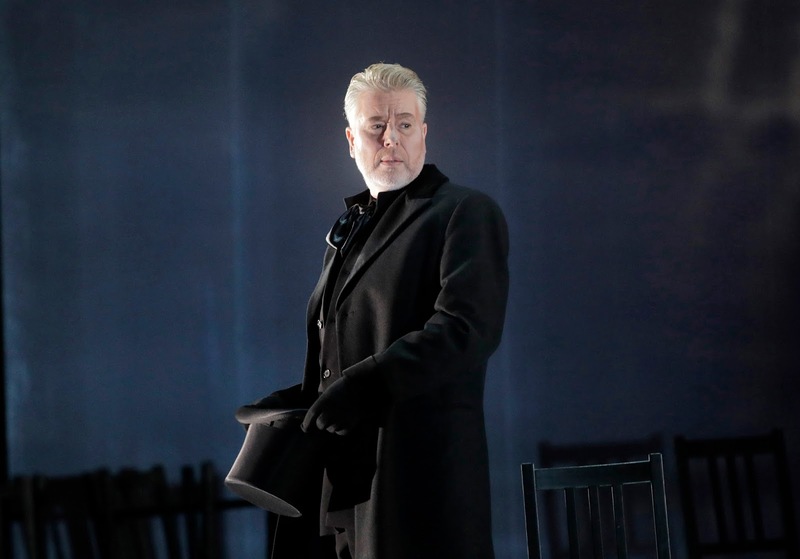 Dramatically, he seems more comfortable on stage than he used to - and he was much better directed than in Don Carlo, where he and Ana María Martínez were left adrift on the stage. He was certainly the picture of youthful ardor, and, eventually, tortured denial. The smaller roles, and there are many, were mostly very well cast. James Creswell was a magnificent Comte Des Grieux, singing with plush tone and the very picture of chilly hauteur. I wanted to introduce him to Giorgio Germont; they'd make such a cute pair of nasty fathers, using essentially the same arguments to create chaos in their sons' lives. Creswell was in both Tales of Hoffmann and Mary Magdalene, but didn't make this kind of impression. More, please; such a beautiful voice. 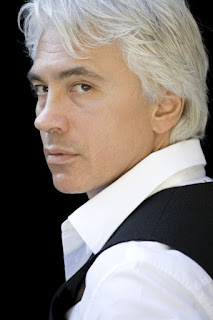 Robert Brubaker was amusing as Guillot de Morfontaine (and his French is superb). I was not thrilled by David Pershall as Lescaut; next to Creswell and the other male singers, he sounded vocally unfocussed, though his acting was fine. The staging was something to see, making good use of a wall-like unit set that was used for a variety of entrances, including floating Manon in after she wanders around on its parapet. 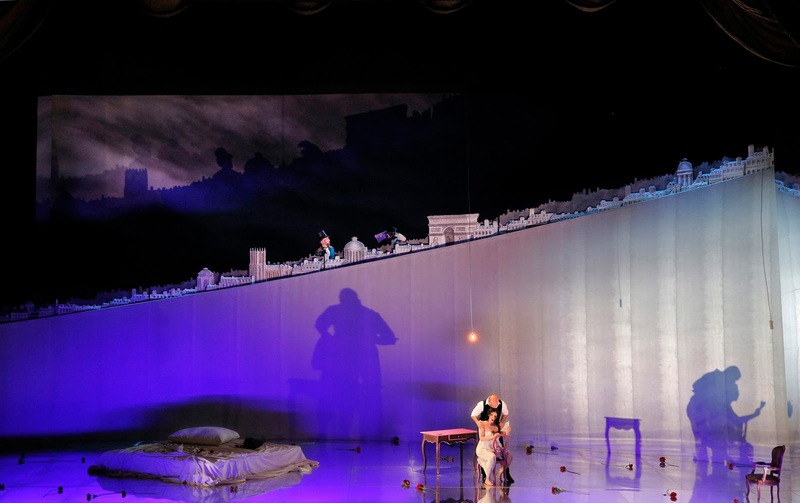 The stage was covered with a mirrored surface, which was a feature of several Mansouri-era productions. 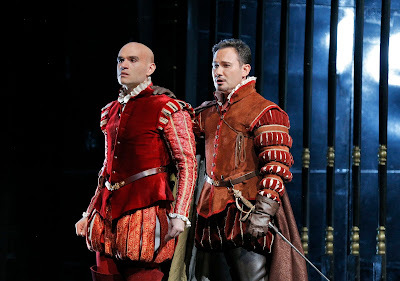 Somehow, this worked much better than those (Don Carlo, La Favorite, and others), because of the prevailing brightly colored costumes and saturated lighting. 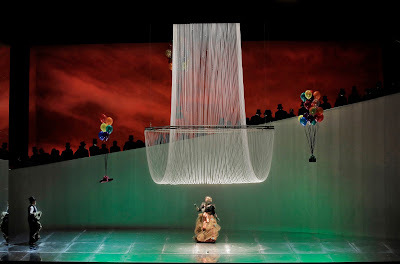 The combination of the mirrored floor and bright lighting sometimes bounced so much light into the house as the raise the light level in the audience significantly; I found myself wondering whether the lights in the chandelier were on. Later in the scene, a cone of webbing descends from the flies and surrounds Manon, who runs out of it to go find Des Grieux at St. Sulpice. I have no idea what this was about. The floating balloons and packages are cute, though. Not visible in any of the press photos: suspended Jesus looming over the stage at the top of the wall, with a completely black backdrop. That was a striking touch! 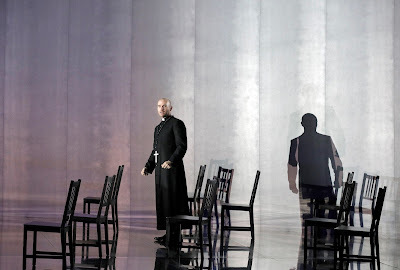 Mercifully, the press photos don't include the most ridiculous stage business I've seen in a while, falling into Department of Unintended Hilarity: the point where Fabiano rips open his cassock to show his great passion for Manon. The entire audience burst into laughter, which, I gotta say, really did break the mood. I have predicted that this will disappear before the end of the run. The press photos also don't include the bit shortly after the photo above where Dehn and Fabiano re-enact the end of Act I of Die Walküre by rolling around on the floor together, which I suppose falls under Department of Sacrilege rather than Department of Inappropriate Sibling Love. You can't quite tell from the photo above, but between the cut of her dress and the way her hair is piled on top of her head, I'm absolutely certain that Dehn's look in this scene invoked a famous portrait of a notorious woman. She looked fabulous in the dress, too. The final scene was beautifully staged, with the stage almost completely darkened and Dehn and Fabiano lit primarily from the side, focussing your attention tightly on them. There's a press photo of that scene, but you can't see much of the stage, alas. All in all, I'd call this a very successful outing; it's good enough that I'm thinking of going back for more. So, San Francisco Opera and San Francisco Symphony are both looking for music directors. MTT will step down at the end of the 2019-20 season; Nicola Luisotti's last performance as music director of SFO was last month, but Matthew Shilvock has said that the search could take as long as two or three years, that is, out to 2019 or 2020. So let's just assume for now that the two organizations' timelines are similar, although who knows who will handle various music director responsibilities absent an actual music director at SFO. Now, a few years back, in 2010, Janos Gereben and I went through the exercise of speculating about who could possibly take MTT's place. The results are here. Re-reading the article, the first thing I'm struck by is that several of our candidates have died or are otherwise unavailable: Claudio Abbado, Kurt Masur, Lorin Maazel are all gone; James Levine's health doesn't allow him to take a music directorship at this point. But I think there are so many talented conductors out there that SFS is in an enviable position. The orchestra is in good financial shape and has a history of good management; the orchestra is playing at a very high level indeed. Music director of SFS is an attractive job; the kind of job that people with pretty good jobs would consider leaving to take. And there I'm thinking of conductors at good, not quite great, orchestras; Manfred Honeck and Pittsburgh, for example. Or Kryzstof Urbanski. But I don't think SFS could lure Osmo Vanska from Minnesota; he has made them a terrific orchestra and he is married to Erin Keefe, the concertmaster. That's a significant two-body problem right there. My take: the most prestigious openings coming up, in no particular order, are SFS, Royal Opera, Opera de Paris, Bavarian State Opera (Bayerische Staatsoper), San Francisco Opera. Not sure where Dallas, the Opera National de Lyon, and Montreal fall in here. Who knows whether any of the above might work for SFS? Most of them don't have a track record of guest conducting at SFS; I think that only Robertson does, although Metzmacher has been through a couple of times, and maybe Tovey has as well. The closed positions follow; a conductor who has been in a new job for not-that-long probably won't leave it very quickly. I think the first thing to consider is who has been a successful and impressive guest conductor over a period of time with SFS. Here, the names that come to mind, immediately, are Osmo Vanska (not likely to leave Minnesota), Susanna Mälkki (chief conductor of the Helsinki Philharmonic, principal guest conductor of the LAPO, has good relationships with many major orgs), Krysztof Urbanski, Vassily Petrenko (has been in a few times, I think), David Robertson (has been an excellent guest conductor for at least 12 or 15 years). Is it remotely possible that Donald Runnicles might want to return to the Bay Area? Would James Conlon take SFS? He's a great conductor who has not had a music director job at one of the top US orchestras. Who else? Okay, updated to include: Pablo Heras-Casado, who has given some terrific concerts with SFS. There are a few people we haven't had here yet, among whom the first name in my mind is the prodigiously talented Mirga Gražinytė-Tyla, aka MGT. I hope she'll be a guest at SFS some time, but she is just a couple of years into a prestigious appointment at the CBSO. I was mightily impressed with Ludovic Morlot when he conducted the BSO in SF during the centenary year, and they do seem to love him in Seattle. Lastly, a friend saw a comment elsewhere that I consider about as ludicrous as it gets: that only Gustavo Dudamel would do. That is just silly. Not only are there plenty of equally good or better conductors around, but Dudamel has one of the best jobs in the world: the LA Phil is on an unusually sound financial footing owing to Hollywood Bowl income; it has had excellent management for decades; the orchestra is excellent and improving; they play the most diverse and interesting repertory around, and they perform in the greatest concert hall in the country. How on earth would SFS be an improvement for him? I'm a resident of California and I've had the pink organ donor dot on my driver's license for many years. This morning, I went through the DMV's online donor registration process as well, to make sure there wouldn't be any misunderstandings if I die in circumstances that would make me eligible to be an organ donor. That's because I read Terry Teachout's blog posts this morning. When I read the first, a book review, I thought, wow, that must have been intense for Terry to read. Then I got to his second post, a coming-out of sorts, and knew why he'd written the review. I registered because something bad happening to me could mean something good for another person. I have friends whose lives were transformed by receiving a donated organ. If you're able to donate (many cannot, for reasons of age, illness, or faith), please register.